To lose weight, you need to take in fewer calories than you burn. Eating fewer unhealthy foods like refined carbohydrates and sugar and more healthy foods like complex carbs and healthy fats can help. Packed with fiber and omega-3 fatty acids, flaxseeds are a nutritious food to add to your weight-loss diet. Having a smoothie as a snack or meal replacement can help keep you satisfied until your next meal and even reduce your calorie intake to spur weight loss. Check with your doctor before including flaxseed in your diet as it may interfere with some medications. It can also be unsafe for pregnant women and those with certain conditions, including diabetes and bleeding disorders. Flaxseed comes from the plant Linum usitatissimum. Its seeds and oil have been used medicinally to treat gastrointestinal conditions, high cholesterol and blood pressure, acne, attention deficit disorder, diabetes, obesity and depression. It boasts a range of nutrients, but the two often touted for health benefits are the omega-3 fatty acids and dietary fiber. It is best to grind flaxseed before eating it because the body has trouble breaking down the outer shell during digestion and thus cannot absorb the nutrients of whole flaxseed. Prepare your smoothies in a blender capable of breaking apart seed hulls, or grind the seeds before adding them to your smoothie. A typical serving size of flaxseed is 1 to 2 tablespoons. One tablespoon of flaxseed is low in calories with less than 40, but high in fiber with 2 grams. Low-calorie, high-fiber foods are excellent weight-loss foods because you can fill up without exceeding your calorie budget for the day. Each ground tablespoon also has more than 2 grams of heart-healthy polyunsaturated fats. Flaxseed is a good source of vitamins and minerals, too, especially B vitamins, iron and potassium. The key to making an effective weight-loss smoothie with flaxseeds is to keep it low in calories and up the fiber content even more with fruits and veggies. Choose a low-calorie base such as plain water, skim milk or almond milk. Add a handful of blueberries -- 1/2 cup has only 42 calories and adds another 2 grams of fiber to your smoothie. 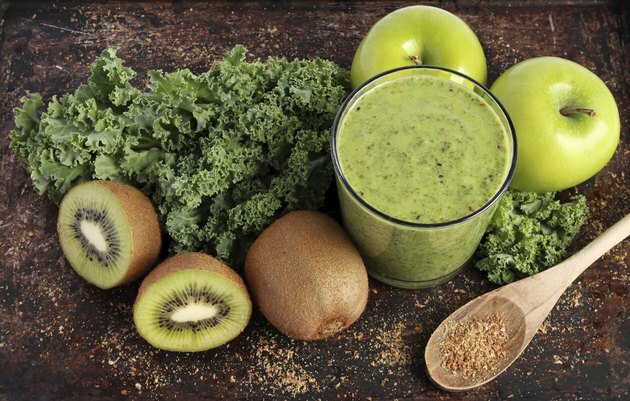 Next, add a handful of leafy greens for vitamins, minerals and more fiber -- baby kale has a mild flavor that works well in a smoothie. If you like a sweeter smoothie, don’t add sugar -- instead, use half a banana instead for loads of potassium, more fiber and a touch of natural sweetness. Lastly add a tablespoon or two of flaxseed and blend to a smooth consistency. Flaxseed smoothies will only help you lose weight if they’re included as part of a reduced-calorie diet. To lose weight, you have to eat fewer calories than your body burns for energy. If your flaxseed smoothie takes you over your calorie budget for the day, you will gain weight. Eat several smaller meals each day and include a flaxseed smoothie as one of those meals, or replace one of your larger meals with a flaxseed smoothie. Add up your calories for the day to make sure you’re staying within your calorie needs for weight loss. Speak to your doctor about how many calories you should eat each day to lose weight safely.